So-called sin taxesthe taxing of certain products, like alcohol and tobacco, that are deemed to be politically incorrecthave long been a favorite way for politicians to fund programs benefiting special interest groups. But this concept has been applied to such sinful products as soft drinks, margarine, telephone calls, airline tickets, and even fishing gear. What is the true record of this selective, often punitive, approach to taxation? Taxing Choice shows that the record of sin taxes has been anything but successful, as they have hindered economic progress and failed to deliver the promised social benefits. In addition, the costs of selective taxation fall disproportionately on lower income groups while politically powerful special interest groups benefit. Sin taxes also foster political corruption and self-serving, largely unaccountable bureaucracies. Furthermore, policies discriminating against certain products and behaviors through tax policy represent ominous trends that can easily be extended into other areas of life. If tobacco and alcohol are considered dangerous and subject to discriminatory taxation, what is to prevent the same taxes from being applied against fatty foods, sunbathing, or even obesity? Nineteen distinguished scholars analyze the history, applications, and results of sin taxes in this volume. This is a timely and far-reaching book of great interest to economists, policy makers, historians, sociologistsor anyone who pays taxes! Chapter 11: Taxation and the Consumption of WineAre Excise Taxes the Answer to the Healthcare Crisis? Nineteen eighty-four arrived ten years behind schedule. With those words, Taxing Choice: The Predatory Politics of Fiscal Discrimination, edited by University of Mississippi economist William F. Shughart II, begins a journey aimed at showing that in tax policy, things, as librettist William S. Gilbert wrote, are seldom what they seem. Shughart has marshalled the work of 17 scholars to investigate the economics, history, and politics of selective excise taxes, including those taxes on tobacco, alcohol, gasoline, and guns, which, at least in theory, are supposed to influence consumer choices in order to bring about more rational decision making in the marketplace. As a work in the tradition of the public choice school, Taxing Choice goes well beneath the surface to show that more is at work than governments enlightened guidance of consumer activity for the public interest. As in so many other areas, it seems, as Shughart writes, that pressure-group politics underlies the push for selective taxation. In other words, a facade of economic theory has been pasted together to rationalize less attractive motives for particular taxes: revenue raising, protection from competition, and nanny-like intrusion into personal lifestyles. The classic economic defense of selective excise taxes is debunked by Shughart in Chapter 1. There he shows the weakness of three commonly made arguments: 1) that excise taxes on tobacco and alcohol raise revenue in ways that minimize social costs; 2) that such taxes are like user fees because they target those who heavily use certain government and private services, such as health care; and 3) that such taxes can compensate for burdens imposed on innocent victims by users of the products taxed. He argues that while those arguments may apply in special cases, they do not constitute a general case for such taxation. Shughart also shows that excise taxes twice violate the fairness canon of taxation because they hit poorer people harder than richer people (they are regressive) and they hit some products but not others. He points to a tension in excise-tax policy: to the extent it discourages consumption of the taxed product, it is a bad revenue raiser. Chapters Two and Three look at selective excise taxes through American history. Brenda Yelvington of the University of Mississippi shows that while the earliest excise taxes, such as the tax on whiskey, were partly motivated by a desire to tax alleged luxuries, they gained prominence as revenue raisers during Americas wars. Excise taxes also played an important role in Franklin Roosevelts New Deal. Such taxes, though they still exist, became less important when the personal income tax was passed in 1913 and became a mass tax during World War II. With the Clinton proposal to use the tobacco tax to discourage smoking and fund health care, the government has come full circle in justifying excise taxes. In the following chapter Adam Gifford, Jr. of California State University, Northridge, looks at three historical examples of the excise tax: the whiskey tax, including the one that excited rebellion in western Pennsylvania in 1791; the oleomargarine tax; and Englands knowledge tax, that is, taxes on newspapers and other means of disseminating knowledge. Giffords discussion demonstrates how excise taxes are used for purposes other than raising money. The tax on liquor was in part motivated by the desire to impose temperance. The oleomargarine tax was classic rent seeking, in which the dairy interests used the power of the state to burden a competitor. The knowledge tax was a form of rent seeking too; the government sought to benefit itself by handicapping the competition in the market for political ideas. Gifford concludes by showing how those taxes influenced the development of the U.S. government. The next several chapters examine the predatory nature of excise taxes. Randall Holcombe of Florida State University looks at specific examples of excise taxationsoft drinks and containers, airline tickets, tobaccoto demonstrate the political costs and welfare losses entailed. Holcombe argues that the overall costs of excise taxes are higher than those from broad-based taxes because the tax often falls on a subgroup of the population. Thus the majority has an opportunity to get something for nothing and the subgroup will be willing to spend lots of money to protect itself. The incentive to use selective excises lies in the politicians ability to sell a tax to a majority of voters precisely because it will fall on a minority. Holcombe concludes by arguing that the economic justifications for excise taxation ignore political realities, namely that taxes result from a process in which the legislature brokers the demands made by opposing interests. 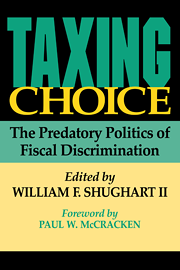 Dwight R. Lee of the University of Georgia follows with a chapter showing how the political authorities use economic justifications for excise taxes to overcome public resistance. He begins by noting that the politicians appetite for revenue is insatiable because the transferring of revenue to special-interest clients is the source of their political support. Yet as taxes and spending increase, the people become more resistant. Consequently, politicians would be attracted to a method of taxation that relaxes that resistance. An excise tax can dissolve taxpayer resistance by being sold as a way to discourage the sin and to compensate for damage created by the sinners. Lee shows that the earmarking of excise revenues would seem to restrict the activities of politicians, but the limitation is more apparent than real. Since money is fungible, the new revenues can allow those from general taxes to be used for other purposes. Gary M. Anderson of California State University, Northridge, concludes Part I of the book by showing the curious connection between sin taxes and prohibition. He seeks to explain the paradox that governments have given up revenue-producing taxes for revenue-draining prohibition. Why? Anderson resolves the paradox by employing the interest-group model of government; that is, organized groups, including groups within the government itself, have an incentive to influence the state for the benefits that inevitably flow from regulation. Tracing the tendency of sin taxation to move toward prohibition with four examples, the War on Drugs, alcohol prohibition, gun control, and cigarettes, he shows how in each case, law-enforcement and other government bureaucracies have an incentive first to increase the tax to prohibitive levels and then to promote outright prohibition in order to bolster their power, even if means the treasury will forgo revenue. Bruce L. Benson and David W. Rasmussen of Florida State University follow with a close examination of the War on Drugs from 1984 to 1989, a period in which drug arrests skyrocketed then fell. They describe how what began as a tax on drugs in 1914 turned into prohibition thanks to the intragovernmental lobbying of law enforcement bureaucrats. Competition among bureaucracies also was important to the story. The authors pay particular attention to asset forfeiture (confiscation), a tool that creates perverse wealth incentives for law-enforcement officials. More myths fall in Richard Wagners chapter on alcohol taxation. The George Mason University economist shows that the tax cannot be justified on the grounds that drinkers impose significant costs on society. In fact, much of what are considered social costs are in reality private costs. For example, the lost productivity of heavy drinkers is paid for not by society by those workers, who will reap a lower wage. Similarly, the added medical costs from drinking, if indeed there are such, are born mostly by the drinkers themselves. Drunk drivers do indeed create social costs, writes Wagner. But taxation is not the way to correct for them because it indiscriminately hits responsible users of alcohol. Penal policies that target the guilty are preferable. Paula A. Gant of the University of Louisville and Robert B. Ekelund Jr. of Auburn University turn to the matter of unintended consequences in their chapter on alcohol taxes, particularly the tax increase in President Bushs 1990 budget package. That increase imposed a proportionately larger share of the increase on wine versus beer and spirits. The authors point out that not only did that discriminatory increase violate accepted notions of equity, it also shifted consumption away from wine because it became relatively more expensive than beer and spirits. The irony is that wine is more closely associated with responsible drinking than either spirits or beer. And wine has been linked to health benefits. Thus, this tax increase, which was partly justified as a corrective tax, was especially ill advised. Richard Vedder of Ohio University brings Part II to a close with a chapter that demonstrates that cigarette taxation at the state level collides with ever-present propensity of people to buy in the cheapest jurisdictions and to smuggle. Those phenomena limit revenues and restrain states in their tax policies, as shown by recent experiences in Canada and along the California-Mexico border. Vedder looks closely at the differences in tax levels and the extent of cross-border activity. Jonathan R. Macey of Cornell University School of Law shifts gears as he opens Part III with a chapter on the effects of selective taxation of executive salaries over $1 million a year and the corporate compensation arrangements known as excess golden parachute payments and greenmail. Those taxes were motivated not by sound economic thinking, but by an egalitarian suspicion of undefined corporate greed. For Macey, these were punitive sin taxes; the sin was that of making too much money. He shows that each of the targeted activities is integral to the efficient operation of the capital markets and that taxation exacts a toll on the entire economy. Since taxation can have consequences similar to prohibition and since the Second Amendment to the U.S. Constitution affirms the right of people to keep and bear arms, excise taxes on guns have constitutional implications, argues Bruce H. Kobayashi of George Mason University Law School in his contribution to Taxing Choice. The same can be said for laws assigning liability for the misuse of guns to third partiesan indirect tax. Kobayashi begins by noting that the gun prohibitionists would prefer an outright ban, but pragmatism forces them accept taxation instead. As with so many excise tax advocates, they argue mistakenly, the author showsthat the tax is necessary to compensate for the alleged social costs from gun use. He states, rather, that taxation punishes lawful gun owners and could increase crime by discouraging ownership by law-abiding citizens. In the course of his argument, Kobayashi debunks several celebrated studies purporting to show that guns cause violence. The book closes with a refreshing chapter about taxes and smoking, by Gordon Tullock of George Mason University. Tullock takes up the issue of the external effects of smoking, which are used to justify the tobacco tax. He suggests that smoking could actually save the public moneyfor example, if the suggestive studies of tobacco as a preventative for Alzheimers disease are correct. Moreover, smokers who die relatively young of lung cancer will not get more expensive, longer lasting diseases when they are older or collect Social Security. He also points out that raising the cigarette tax could reduce revenues. All of this demonstrates that fiscal arguments are not decisive. Ultimately, Tullock writes, policies about smoking must be made on non-economic criteria. The seemingly plausible, but flawed, case for selective excise taxes got a big boost from the Clinton administration when it released its health-care reform, complete with an increase in the tobacco tax. We have not heard the last of such proposals. Thus, Taxing Choice is a timely and important contribution to the public debate. William F. Shughart II is Senior Fellow at The Independent Institute and Professor of Economics and Finance at the University of Mississippi.